The Toyota 8-Series forklift range has won a Japanese Good Design Award 2014 and has received a Special Mention in the 2015 German Design Awards. The Good Design Award is Japan's only design evaluation and commendation award, and is contested by companies and designers from around the world. The German Design Award is a highly sought-after prize, Toyota says: "To be nominated a product must be recommended by one of the judges or have previously won an international design award. 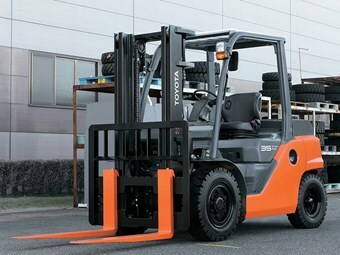 The Toyota 8-Series is the first forklift to receive a Special Mention in the awards." The German awards received 2,250 nominations from around the world. Other Special Mention winners include the Mercedes-Benz C Class, Audi A8 facelift and Vodafone internet router. Earlier this year Toyota Material Handling Australia (TMHA) launched the new 8-Series 3.5 to 8-tonne range, whose highlights include "a new 65kW electronic fuel injection-equipped 3.7-litre LPG engine offering fuel savings of up to 20 per cent compared with the superseded model". Other features are Toyota's System of Active Stability, which helps reduce the likelihood of lateral or longitudinal roll-overs, a redesigned chassis with fully stamped steel plate construction and ergonomic improvements such as increased floor space and a larger step. Click here to look up forklift specifications.